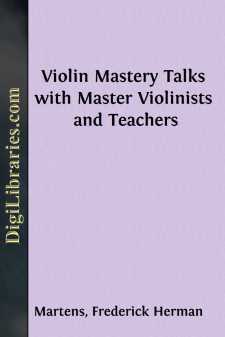 Who is there among contemporary masters of the violin whose name stands for more at the present time than that of the great Belgian artist, his "extraordinary temperamental power as an interpreter" enhanced by a hundred and one special gifts of tone and technic, gifts often alluded to by his admiring colleagues? For Ysaye is the greatest exponent of that wonderful Belgian school of violin playing which is rooted in his teachers Vieuxtemps and Wieniawski, and which as Ysaye himself says, "during a period covering seventy years reigned supreme at the Conservatoire in Paris in the persons of Massart, Remi, Marsick, and others of its great interpreters." "Strange to say, my father was my very first teacher—it is not often the case. I studied with him until I went to the Liège Conservatory in 1867, where I won a second prize, sharing it with Ovide Musin, for playing Viotti's 22d Concerto. Then I had lessons from Wieniawski in Brussels and studied two years with Vieuxtemps in Paris. Vieuxtemps was a paralytic when I came to him; yet a wonderful teacher, though he could no longer play. And I was already a concertizing artist when I met him. He was a very great man, the grandeur of whose tradition lives in the whole 'romantic school' of violin playing. Look at his seven concertos—of course they are written with an eye to effect, from the virtuoso's standpoint, yet how firmly and solidly they are built up! How interesting is their working-out: and the orchestral score is far more than a mere accompaniment. As regards virtuose effect only Paganini's music compares with his, and Paganini, of course, did not play it as it is now played. In wealth of technical development, in true musical expressiveness Vieuxtemps is a master. A proof is the fact that his works have endured forty to fifty years, a long life for compositions.